Author: Ethelbert E. Kari. Series edited by: Wilhelm J.G. Möhlig, Bernd Heine. 14 pp. Roman, 430 pp. This book is the first detailed, descriptive and analytic grammar of Degema, a Delta Edoid language spoken in the south-eastern Nigerian communities of Usokun-Degema and Degema Town. The variety of Degema represented in this book is the Usokun dialect, based on the author’s speech as a native speaker of Degema. This study covers the phonological, morphological and syntactic features of Degema. It also includes basic information on the semantics and lexicon of the language. 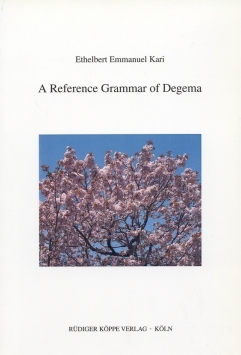 Among many striking features of Degema that are described in this book are a vestigial noun class system, an elaborate (anaphoric) clitic system and concordial serial verbs, where in some cases tense-aspect marking on the initial verb is repeated after non-initial verbs, the interaction of tone with negation, tense, aspect and modality, the use of ideophones and cognate objects as a means of intensifying verbal meaning, the use of serial verbs as a major means of clausal coordination, an advanced tongue root vowel harmony in which ten vowels divide neatly into two sets of five each – expanded and non-expanded – distinguished by pharynx size, downdrift and intonation. In an age when many small languages are being ‘swallowed up’ by big and influential ones, this comprehensive documentation of Degema language is a welcome development for the Degema-speaking community and a credit to the linguistic community. Overall, the scope and content of the grammar are quite excellent and the book truly lives up to its title of being a reference grammar. The author’s native-speaker intuition and breadth of knowledge obviously lends authority to his treatment of sample sentences, all of which are carefully provided with full morpheme glossing. Examples were also tested against the intuition of other native speakers however, during a period of fieldwork, beginning in 1996, so that the description here is valid for a broader language community and not simply for the author’s idiolect. [...] The fact that Degema in either of its dialectal forms is a potentially endangered language, given the relatively small number of speakers vis-á-vis more widely spoken languages in southern Nigeria, makes the appearance of this book all more timely.